The holidays. When did the magic turn into madness?!? As a child, it’s a time that we think will never get here. As an adult, we are often ready for it all to be over! 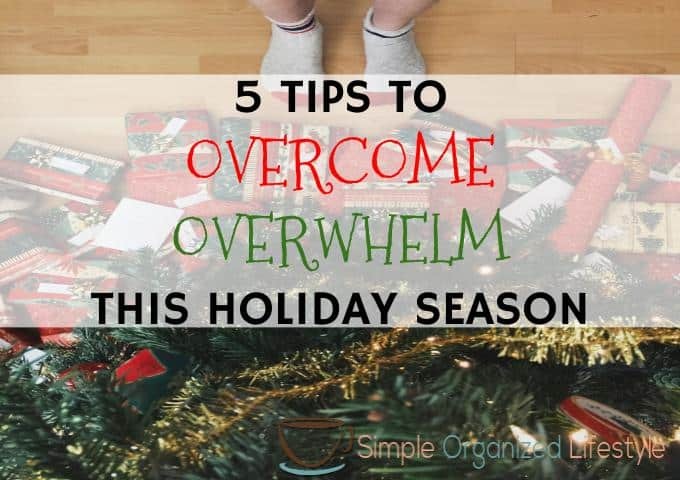 I hope these 5 tips will help you overcome overwhelm this holiday season. Everything will keep rolling along even if the presents are not tied with burlap bows and the dessert is not homemade. Think about the things you are doing or want to do and decide if there’s an easier way. I used to always try new recipes at Christmas but they were always overlooked. Part of that may be because my new recipes make my family nervous but people also are creatures of habit… they are looking forward to your specialities so simplify by sticking to those. You’ve probably heard the quote if you fail to plan, you plan to fail. Your holiday planning does not have to be elaborate, but you need something as a go-to reference. Mine is a simple one page print out. It contains names of people I want to buy gifts for, the meals that I always cook and a few reminders. It’s very simple but gives me a guide so that I’m not wondering what I have done and what I have left to do. Choose the holiday traditions that are most important to your family and say no to things that will bring on additional stress. If it’s an act of service and you feel guilty, think about how you can still contribute but on your own terms. Maybe you can’t coordinate a toy drive, but you can donate some toys to the cause. You can’t do it all and you shouldn’t try to do it all. At the driver who cuts you off. At the checkout girl who just announced her lane is closed. At the postal carrier who tosses your packages on the driveway. In the midst of the madness, a smile will keep you steady and grounded. It will lift others, which will lift you in return. In addition to all of the running around and crossing off to-do’s, please do not skip the peppermint milk shakes or gingerbread latte! This is a time when it’s okay to add a reward here and there. Enjoying some seasonal favorites helps our attitudes. Take a bath, take a walk and find pockets of time to slow down and catch your breath. May you overcome overwhelm this holiday season and embrace the time ahead for all of the blessings it brings.